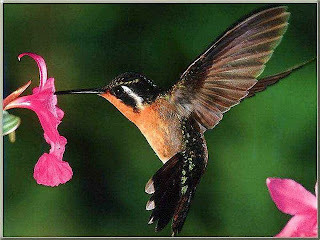 Animal Wildlife | Hummingbird | There are nearly 350 known species of hummingbird, found throughout the Southern Hemisphere. Although some species of hummingbird are occasionally found further north, these small birds tend to prefer the more tropical climates. 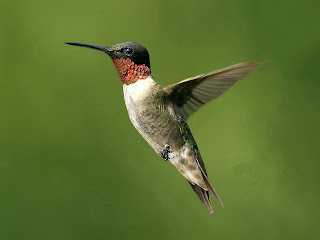 beat their wings 15-80 times every second (depending on the species) meaning that the hummingbird has the incredible ability to hover in the air. 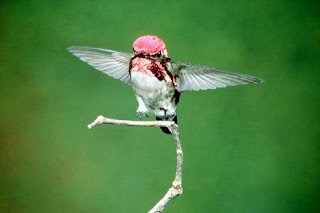 The hummingbird is also the only species of bird that is able to fly backwards. The bee hummingbird is native to Cuba and is the smallest bird in the world, measuring around less than 5cm tall and the bee hummingbird is around the same weight as a penny. 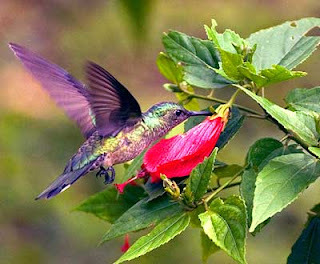 The giant hummingbird found in the Andes is the world's largest hummingbird measuring more than 20cm in height. Hummingbirds have a long, pointed beak which when combined with the hummingbird's extendible tongue allows the hummingbird to gather nectar from deep inside flowers. As nectar is not an adequate source of protein, hummingbirds also prey upon insects and spiders in order to get all of their nutrients, especially when the hummingbirds are feeding their young. Many species of hummingbird do not survive their first year of life due to their vulnerability. 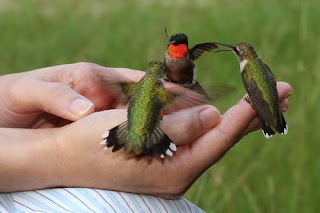 Those hummingbird individuals however that do survive tend to have an average lifespan of around 4 years but some hummingbird individuals can live for much longer, with the oldest recorded hummingbird being at least 12 years old. Female hummingbirds make a cup shaped nest in the trees with male hummingbirds not helping with the nest building at all. Most species of hummingbird lay 2 white coloured eggs which are surprisingly large when the small size of the hummingbird is considered. The hummingbird eggs usually hatch within 3 weeks to reveal the tiny hummingbird chicks. Due to their small size, hummingbirds are preyed upon by a variety of animals including snakes, lizards and larger birds. 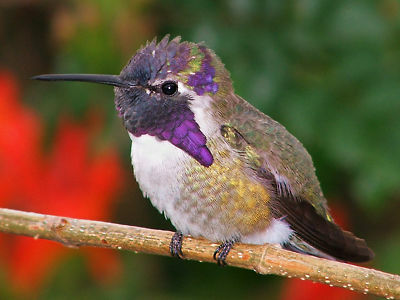 Both wild and domestic cats also prey on the tiny hummingbird, but hummingbirds are known to be a difficult meal to catch for any predators due to their speed and agility particularly in the air. Hummingbirds have played a significant part in local myths and folklore. One of the Aztec gods was depicted as a hummingbird and one group of people believed that the hummingbird brought fire to the world. The tiny Caribbean islands of Trinidad and Tobago is known as the land of the hummingbird and the hummingbird can even be seen on their coat of arms. The hummingbirds name is thought to have originated from the noise the hummingbirds wings make when the hummingbird is hovering.